Development of theoretical understanding of the properties of disordered systems, with emphasis on electron and photon localization, photonic crystals, random lasers, graphene, plasmonics, metamaterials and nonlinear systems. The theoretical models developed are often quite sophisticated to accurately reflect the complexity of real materials. In addition, we are completing experiments on metamaterials graphene, plasmonics and photonic crystals. Costas Soukoulis received his B.S. in Physics from Univ. of Athens in 1974. He obtained his doctoral degree in Physics from the Univ. of Chicago in 1978. From 1978 to 1981 he was visiting Assistant Professor at the Physics Dept. at Univ. of Virginia. He spent 3 years (1981-84) at Exxon Research and Engineering Co. and since 1984 has been at Iowa State Univ. (ISU) and Ames Laboratory. He has been an associated member of FORTH since 1983 and was a Professor (part time) at Dept. of Materials Science and Engineering at Univ. of Crete (2001-2011). He has courtesy appointments at the Departments of Materials Science and Engineering and Electrical and Computer Engineering at Iowa State University. He has approximately 447 publications, more than 178 invited lectures at national and international conferences, and about 173 invited talks at institutions. More than 30800 citations, an h-factor of 90 and 5 patents for PBGs and LHMs. Graduated 17 PhD students and co-advised 4 others. Has obtained several grants to support his research from DOE, NSF, DARPA, ONR, AFOR, NATO, EPRI, and European Community. 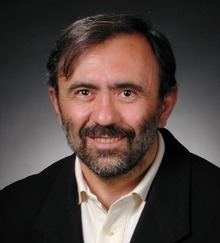 He was the senior Editor (2002-2013) of the new Journal “Photonic Nanostructures: Fundamentals and Applications”, and editor of Optics Letters (2008-2011), and he is a member of editorial board of Physical Review Letters. Finally, a textbook entitled Wave Propagation: From Electrons to Photonic crystals and Left-handed Materials, was published by Princeton University Press 2008. Dr. Soukoulis made the 2014-2016 list of Highly Cited Researchers published by Thomson-Reuters. Prof. Soukoulis is Fellow of the American Physical Society, Optical Society of America, and American Association for the Advancement of Science. He received the ISU Outstanding Achievement in Research in 2001, and the senior Humboldt Research Award in 2002; he shared the Descartes award for collaborative research on left-handed materials in 2005; the first Frances M. Craig endowed chair in Physics at ISU in 2007; Honorary Doctorate from Vrije Universiteit in Brussels, Belgium in May 2011, and has been shared the 2013 James C. McGroddy Prize of APS for New Materials (“For the discovery of metamaterials”). He won the 2014 Max Born Award of the Optical Society Of America. Prof. Soukoulis has been a member or a chairman of various International Scientific Committees responsible for various International Conferences. He has served on several boards and committees for organizations, including NSF, DOE, and European Union. Prof. Soukoulis is Fellow of the American Physical Society, Optical Society of America, and American Association for the Advancement of Science. He received the ISU Outstanding Achievement in Research in 2001, and the senior Humboldt Research Award in 2002; he shared the Descartes award for collaborative research on left-handed materials in 2005; the first Frances M. Craig endowed chair in Physics at ISU in 2007; Honorary Doctorate from Vrije Universiteit in Brussels, Belgium in May 2011, and has been shared the 2013 James C. McGroddy Prize of APS for New Materials (“For the discovery of metamaterials”). He won the 2014 Max Born Award of the Optical Society Of America, won the 2015 Rolf Landauer Medal, ETOPIM International Association. Prof. Soukoulis has been a member or a chairman of various International Scientific Committees responsible for various International Conferences. He has served on several boards and committees for organizations, including NSF, DOE, and European Union. Prof. Soukoulis and his collaborators at Ames Lab. have achieved international recognition for their work on theoretical understanding and experimental realization of photonic bandgap (PBG) materials. In particular in 1990 and 1994, they were the first to suggest photonic crystal designs (diamond lattice and the woodpile structure, respectively), which gave the largest omni directional photonic band gaps. This was a critical time in the early stages of the field, when some doubted the feasibility of PBG materials. Many experimental groups all over the world still use his woodpile structure to fabricate PCs at optical wavelengths. Prof. Soukoulis has been instrumental in bringing forward the revolutionary fields of photonic crystals (PCs) and left-handed metamaterials (LHMs), extending the realm of electromagnetism (EM), and opening exciting new applications. In particular, Prof. Soukoulis and his colleagues were the first to demonstrate magnetic response and negative index of refraction at optical frequencies, which do not exist in natural materials. Soukoulis made important contributions to wave propagation in periodic and random media (electron and light localization, and random lasers). Soukoulis and Economou first prove conductance is g=(e2/h)T. By the way, all three of these accomplishments have led to an enormous number of subsequent theoretical and experimental studies, by many groups from around the world. Prof. Soukoulis has proven that he has the ability to productively change research fields and to establish new interdisciplinary approaches. The PCs field came into existence due partly to the work of Soukoulis and his collaborators on finding the conditions for localizing EM waves. Their work on semiconductor physics helped them to first find a periodic lattice that will give a gap for EM waves. This way the first PCs was obtained and a new field was generated. The same happened with the field of LHMs, which was an extension of the PC field. L. Luo, I. Chatzakis, J. Wang, F.B.P. Niesler, M. Wegener, T. Koschny, and C. M. Soukoulis, “Broadband terahertz generation from metamaterials”, Nat. Commun. 5, 3055 (2014). Aditya Jain, P. Tassin, Th. Koschny, and C. M. Soukoulis, “Large quality factor in sheet metamaterials made from dielectric meta-atoms”, Phys. Rev. Lett. 112, 117403 (2014). N. Shen, P. Tassin, Th. Koschny and C. M. Soukoulis, “Comparison of gold- and graphene-based resonant nanostructures for THz metamaterials and an ultrathin graphene-based modulator”, Phys. Rev. B 90, 115437 (2014). V. Ginis, P. Tassin, C. M. Soukoulis, and Irina Veretennicoff, “Enhancing Optical Gradient Forces with Metamaterials”, Phys. Rev. Lett. 110, 057401 (2013). P. Tassin, Th. Koschny, and C. M. Soukoulis, “Graphene for terahertz applications”, Science 341, 620 (2013). Z. Huang Th. Koschny, and C. M. Soukoulis, “Theory of pump-probe experiments of metallic metamaterials coupled to the gain medium”, Phys. Rev. Lett. 108, 187402 (2012). P. Tassin, Lei Zhang, R. Zhao, A, Jain, Th. Koschny, and C. M. Soukoulis, “Electromagnetically Induced Transparency and Absorption in Metamaterials: The Radiating Two-Oscillator Model and Experimental Confirmation” Phys. Rev. Lett. 109 , 187401 (2012). Costas M. Soukoulis and Martin Wegener, “Past achievements and future challenges in the development of three-dimensional photonic metamaterials”, Nature Photonics B 5, 523 (2011). C. Kurter, P. Tassin, Lei Zhang, Th. Koschny, A.P. Zhuravel, A.V. Ustinov, S.M. Anlage and C. M. Soukoulis, “Classical analogue of Electromagnetic Induced Transparency with a metal/superconductor hybrid metamaterial”, Phys. Rev. Lett. 107, 043901 (2011). C. M. Soukoulis and M. Wegener, “Optical metamaterials: More bulky and less lossy”, Science 330, 1633 (2010). A. Fang, Th. Koschny, and C. M. Soukoulis, “Self-consistent calculations of loss compensated fishnet metamaterials”, Phys. Rev. B 82, 121102 (R) (2010). M. Decker, R. Zhao, C. M. Soukoulis, S. Linden and M. Wegener “Twisted SRR photonic metamaterial with huge optical activity”, Opt. Lett. 35, 1593 (2010). R. Zhao, J. Zhou, Th. Koschny, E. N. Economou and C. M. Soukoulis, “Repulsive Casimir force in chiral memamaterials”, Phys. Rev. Lett. 102, 103602 (2010). C. M. Soukoulis, S. Linden and M. Wegener, “Negative refractive index at optical wavelengths”, Science 315, 47 (2007). A complete list and full text of most publications can be found at PPM group's web page and at Prof. Soukoulis' ISU web page.